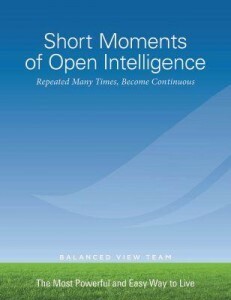 “Open Intelligence”, a state of awakening, is easily accessible in short moments. It is already there and there is no effort to be done to gain this insight. The Balanced View has changed my whole life around for the better, for lack of a better word. Harmonized all my relationships, first and foremost the one with my self. Then all the rest. My relations with family & friends, all flourishing and continuing to do so. To have a true education in the nature of the mind is crucial at this point in time for us humans. To know well being is available in every moment regardless of my circumstances is true freedom. It is bliss. So if you feel you are open enough give it a try, you will not regret it! Intelligence is great but the most important thing is to awaken and become self-conscious!